I was going to wait for another weekend to share this styled shoot by Tenth and Grace but these are too majestic to keep any longer! When Tanya first approach me to collaborate in this shoot, they want something that complements their site, the Knapp's Castle. It's this gorgeous castle ruin in Santa Barbara with amazing view! 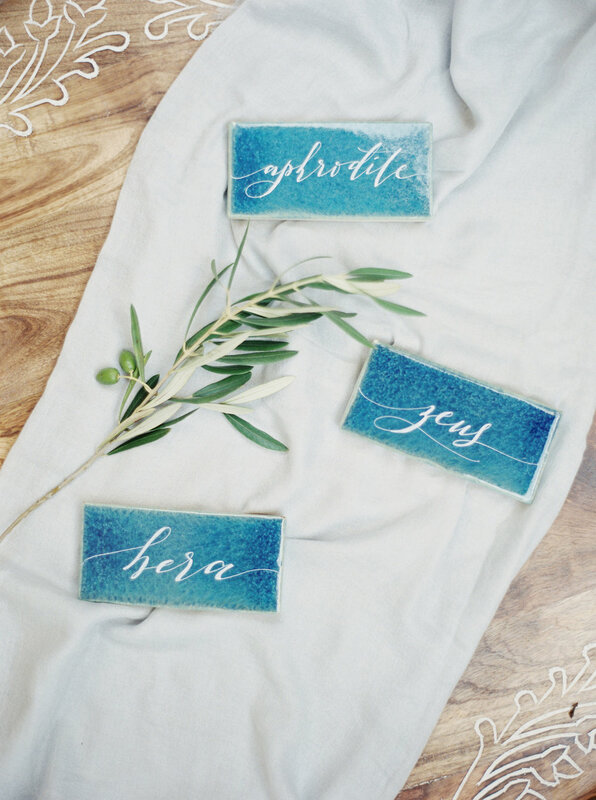 Together with Nicole from Hint of Chic, they envision something that involve calligraphy on fabric and I want to incorporate part of Greek pottery. We settled on an Aristotle's quote on Silk and Willow's ribbon, a Greek poem on muslin fabric, and watercolor invitation suite with classic Greek pottery pattern in Silk and Willow's handmade paper (I'm slightly obsessed with the decked edge and how well it holds the watercolor). But my most favorite part is the gorgeous ceramic place cards! And of course, we have to use Greek's God and Goddesses for the name. But enough with my blabbering. Please enjoy these amazing photos!! !